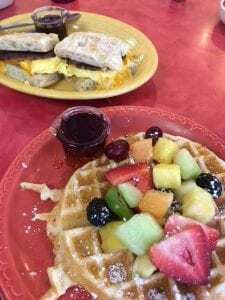 The Walnut Cafe is a known wonderful breakfast spot. 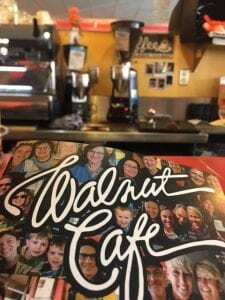 Of course, you can find the Walnut Cafe on 3073 Walnut St. in Boulder. It’s a perfect place to go for a breakfast bite. You will find the older look and feel of the place charming and reminiscent; but the energy, art, and culture proves to be fresh and modern. 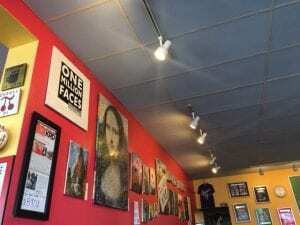 Walking in everything about the Walnut Cafe threatens, “Safe Space.” Brunch spots need more than just good food to keep people coming back for more. It’s obvious by the rainbows, “safe space” stickers, and “love wins” art on the walls that whatever you identify as, the cafe welcomes it. Our hostess rocked unshaven legs, I didn’t see a single waitress who wasn’t ornamented by visible tattoos, and among the typical hair colors, many in the restaurant had green, blue, purple, and pink hair that day too. It was obvious that self-expression was welcomed and celebrated. Creative happy thought was encouraged, as the staff talked about their day and joked amongst themselves openly. It was busy on a Saturday, the wait wasn’t too long and my friend and I were seated at the bar. It reminded me of a scene from the movies. The coffee maker was exposed and full of stickers with character, the juice and open colorful mugs sat in front, and one of the waitresses had a plastic babydoll face glued onto her hat, adorned with spikes. Every inch of the atmosphere screamed, older but classic, with a twist of “be your creative expressive self.” By far the best part of it was the environment. The people and the culture were so accepting. I ordered a waffle with fresh fruit, and organic maple syrup. I shared a few bites off my friend’s plate of a breakfast sandwich. The fruit was springy and flavorful. It was delicious and by far has always been my favorite thing to eat. It was the fluffiest, and softest waffle. The breakfast sandwich is everything you want from a breakfast sandwich, warm gooey, melting cheese, fattening sausage, and all of the oil soaked up from the bread. The taste is certainly something we all need more of in our life! I would recommend the orange juice and hot coffee too. It was a perfect breakfast cafe.